Want to make your reader smarter about what they do with your products, what services you offer, or just to give them help with a certain aspect of their life? Have you ever thought about doing information product giveaways? 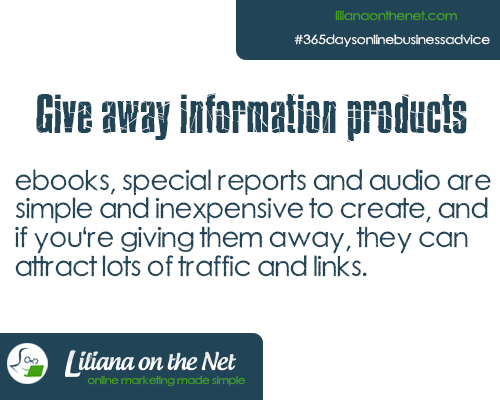 Give away eBooks, podcasts, and other informational products are a great way to do this. Here, we will explore the different giveaways of this type that you can offer with purchases, as special gifts, or even as prizes in contests. 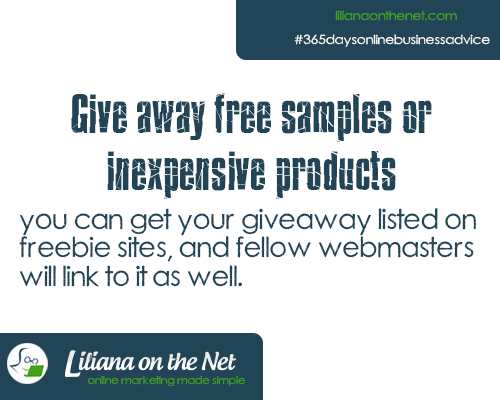 Just giving away things for free can seriously boost your web traffic, and may mean that lots of other link back to your page. eBooks of the informational type can come in many different forms. These can include product manuals, fun information about innovative things to do with your product, and much more. You can offer free eBooks on your webpage, as social media giveaways, on your blog, or even as part of your online shopping cart. eBooks can be used on mobile devices, tablets, PCs, laptops, and E-readers. Be sure to offer these on your own webpage, as this is really the only way to take advantage of the extra web traffic they can generate. Podcasts are another exciting thing to give away to customers or online users. You can do lots of things in podcasts, from interviewing stars, to having comedy sketches, offering original tunes, and more. Many people really love podcasts or other audio downloads because they require no reading, and they can be downloaded onto traditional music players, and transported nearly anywhere. Anything from a drama serial that incorporates product information, to an interview with your employees can be offered in this way. Best of all, these cost relatively little money to produce, and not much equipment. By far, the secret to success, as mentioned before, when giving away eBooks or other informational products is to have people link back to your page when they want to tell others about the information. It is also very helpful if you host these products on your webpage, as this is the only real way to gauge just how many times they have been downloaded. Making these giveaways a limited time offer, or only available to a certain number of customers (or for a certain time period) can also make these giveaways more prized by those online who may be interested. Have you heard about customer generated content? If not, you could truly be missing a real opportunity to reach out to your customers, be shared with a wider audience, and even make more sales. Customer generated content, like what a silly contest may generate, is fantastic for busy business people because it means you get a whole batch of new content that you can use on your website, blog, or social media page without having to pay anything but the cost of a prize. A silly contest where you ask customers to take silly pictures with your product could be a great idea. You can ask them to post the pictures on their blogs, webpages, or on your social media pages. Then, all you have to do is choose a winner of the silly contest. Be sure to offer your product as the prize, as well. If you decide to let people post their entries on their own webpages or blogs, require that in order for their entry to be valid, they link back to your webpage. You will also want to announce the winner on your page. Thinking about perhaps running a video-based silly contest? Think about having customers send in a video where they dance, either alone or with your product. Or, you could come up with other silly contest ideas for what you ask customers to submit. Perhaps you could ask them to write their own wacky skit, send in one of their funniest home videos, or even ask them to do their very best impressions. Again, be sure to announce the winner on your page, and require that all video posts or video descriptions have a link back to your webpage. 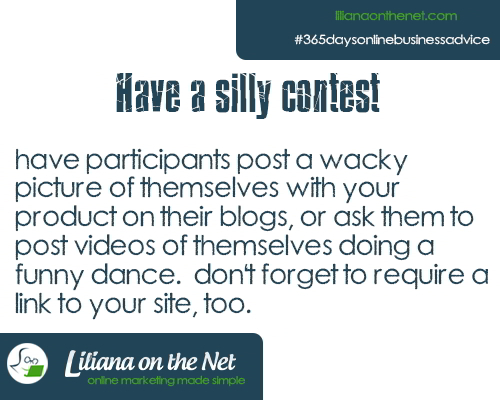 There are plenty of contests that you can hold for your customers, not just a silly contest. Think outside the box by asking them to shoot photos that you could potentially use in ads, commercials you could actually run on TV, or even ask them to finish witty phrases for you. Customers can help you to generate a lot more traffic for your website, and also great logos, slogans, and ad campaigns. All you have to do is offer up a great prize that will catch the eye of those who are already using your products, and choose a winner based upon any criteria you want. Do you want a new and exciting way to promote your blog? If so, there are plenty of potential contests that you can hold for readers to get more people to visit your blog, to make content of your blog more exciting for participants, or even contests that can serve as pure entertainment and idea generation for you as an author. In this article, we will take a quick look at a wide variety of potential contests you could try, including a referral contest, content contest, or even a phrase contest. For best results, try more than one of these. Have a referral contest. Whoever refers the most people to your forum, blog or email list wins. Participants will often post invitations for visitors to join on their websites. Then, all you have to do is keep track of who, in the referral contest, gets the most visitors to join-up. You could perhaps select a prize that would appeal to your larger blog audience in order to get participants to really up-the-ante when it comes to competition. 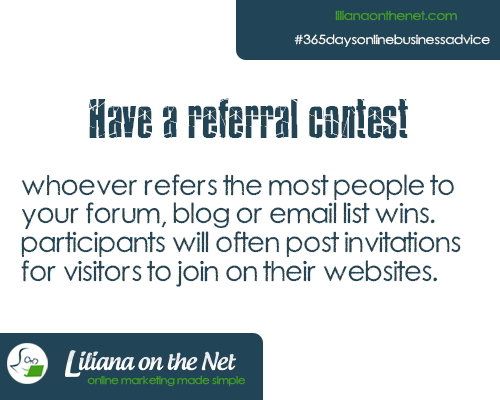 A referral contest can be very successful if they are run correctly. 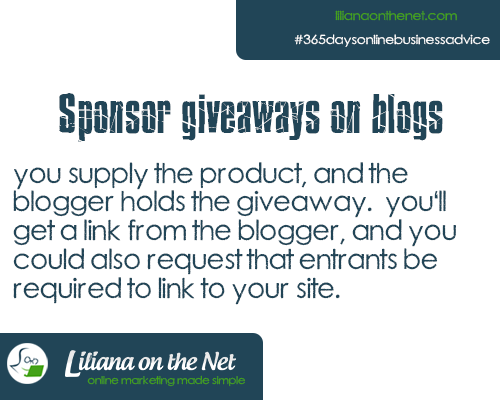 Content contests are fantastic because they get readers of your blog to generate contests for you. Popular forms of this contest ask participants to submit things like pictures, videos, potential commercial content, ideas for posts, artwork, music, and more. They sky is truly the limit, here. You can then award a prize to the person who generates that most exciting and cool content to the winner of the contest. These contests usually work best when they are somehow related to the topic of your blog, forum, or email list. Even readers who do not participate often love content contests for the exciting things they produce. Another popular form of these types of contests are phrase contests. Here, you can just give participants a simple phrase to finish on their own. You can then use the phrases they send in for future content on your blog. You can also choose your favorite of all of them and award a prize. Again, this can often promote your blog because of the neat content it can generate, as well as the fact that people will be interested to know whether or not their phrase won the contest, or if it was posted with the others. Does Link Exchange Still Work? 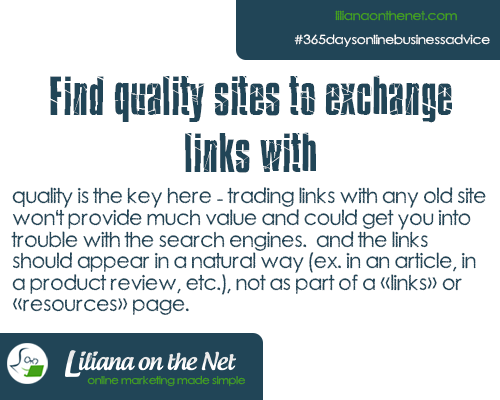 Quality is the key here – trading links with any old site won’t provide much value and could get you into trouble with the search engines. The links should appear in a natural way (ex. in an article, in a product review, etc. ), not as part of a “Links” or “Resources” page. In my view and based on what I achieved in January by having commented in blogs and having linked to other websites as I found informative articles that would add to my content, some of them reciprocated. My website ranking by Alexa jumped from 12 millionths in the world to about 250,000. So my conclusion is that both blog commenting and link exchange do work. But remember only some of link exchange work. Mine weren’t exchange per se, I really quoted an article that enhanced the knowledge of my readers and they reciprocated. Do not waste your time with exchanges that promise you 1000s of links immediately. Do not exchange links with any site or every site under the sun. A link exchange should not be the only way you get your links. Do not swap links to unrelated sites. Do no swap links with sites which content is rubbish or not up to the standard your site is, or their navigation is terrible etc. Their website has a lot of outbound links and yours doesn’t. Your link will be more valuable to them. They give a no-follow link. Find a service or software that lets you manually seek and chose partners. Add a few links at a time. Be consistent, weekly or monthly. You want the number of links to increase over time. Keep the number of links exchanged under 10% of the total number of links pointing at your site. Link exchanges when implemented properly can still be very beneficial to your search engine rankings and can even drive traffic to your site. Of course, one way links are better. I quoted articles because the websites added value to my readers. Therefore the best way is to work on your content that other bloggers on your niche will want to quote. Search engines do not want to see the only links to your website are those reciprocated by you.